Will Eisner, Il Duce’s Locket, 1947, ink on paper, 16 x 23". Title page for The Spirit, May 25, 1947. Will Eisner was one of the most influential and trailblazing comic-book artists in his field, and this retrospective underlines the power of his legacy. Stories about his costumed crime fighter, the Spirit, were published from 1940 to 1952 as a stand-alone comic-book supplement in American Sunday papers. The Spirit—a sophisticated narrative written for an adult audience—was acclaimed for its cinematic compositions (think Orson Welles, Fritz Lang) and innovative use of the splash panel, in which a single image takes up the entirety of the page. Eisner redrew the title logo frequently to fit the mood or theme of every new tale. More than forty of his original Spirit pages are on display, including images of the story Quirte from November 21, 1948, where he relayed the plot through the eyes of the antagonist, a creepy narrative device used much later in John Carpenter’s 1978 film Halloween. Eisner reinvented himself in the 1970s when he discovered the work of underground comic artists such as Robert Crumb, who unabashedly accessed the full depths of his imagination. 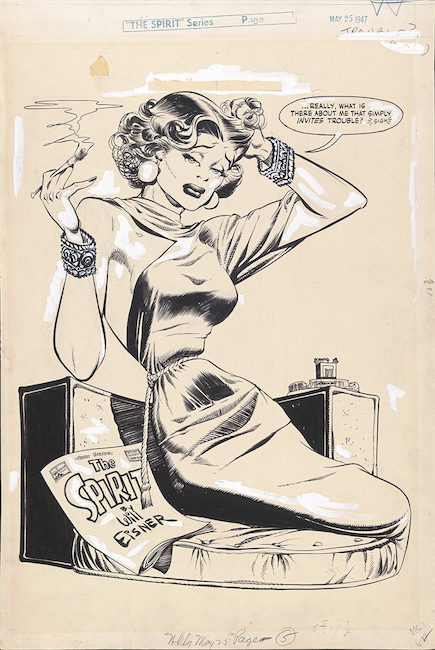 Although not a fan of the pornographic content, Eisner realized through their example that there was an opportunity to create something more personally satisfying, and he set to work on A Contract with God and Other Tenement Stories (1978), a historical, slice-of-life piece about Jews living in Depression-era New York City—the book popularized the designation “graphic novel.” Contract’s lead story is partially based on Eisner losing his daughter to leukemia when she was sixteen. The graphic novel, with its exquisite draftsmanship and dramatic pacing, is nonetheless a realistic and haunting depiction of ethnic identity and the human condition. This and other of Eisner’s literary masterpieces profoundly shaped the medium and were harbingers of Art Spiegelman’s landmark Maus (1991) and Daniel Clowes’s Ghost World (1997).